Minerva, North Elba, St. Armand, Ticonderoga and Westport also approved the suffrage measure, but regardless of whether your town voted for or against suffrage, it is time to celebrate. The centennial of NY women winning the vote is being commemorated in Albany, Seneca Falls, Johnstown, Ticonderoga, Plattsburgh and other towns across the state. 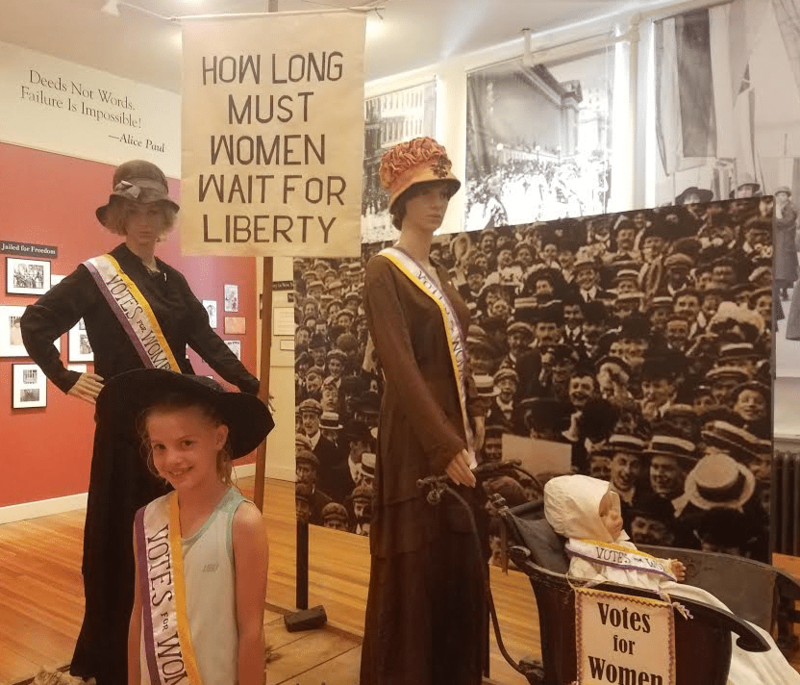 From flotillas to parades, rallies, conferences, and tea parties, the events celebrating the suffrage centennial have been informative and energizing. Whether wearing a white/gold/purple sash, sipping from a Votes For Women teacup, heckling antis in City Park, or visiting the grave of Susan B. Anthony, I have felt the presence and power of suffragists. I even donned the personas of Inez Milholland, Alice Paul, and Mary Hilliard Loines (not at the same time) and spoke their words from the early 1900s. Many of their words, and the words of other suffragists, are eerily relevant a hundred years later. Let’s celebrate November 6 and continue to celebrate women’s rights in 2018, 2019, and especially 2020. There is still much to learn– -and unravel. This year I discovered a heap of misconceptions about suffrage, some nonsensical and some just down-right funny. Indeed, most women were suffering from oppressive or unjust treatment in homes, workplaces, churches, courts, banks, shops, schools, and colleges. Some even endured physical abuse and emotional torment. However, the word “suffrage” means the right to vote. It originates from the Old French “sofrage” meaning plea and from the Latin “suffragium” meaning support, ballot, vote. Its first usage in English with the meaning “political right to vote” was in 1787 in the U.S. Constitution. Myth #2: Women in the United States were given the right to vote in 1920. While it is true that the ratification of the 19 th Amendment in August of 1920 mandated the right of women across the country to vote, several states had already passed laws for full or partial suffrage. Previous to 1917, women in New York had limited local/county voting rights that varied from district to district, but they could not vote in presidential elections. In addition, women did not suddenly have “the right” to vote. In New Jersey, the state’s first constitution (1776) allowed women and blacks to vote if they met the property requirements. Essentially only unmarried women and widows could vote in New Jersey because married women could not legally hold property in their name. Suddenly, in 1807, the state rescinded the “right” from women and other groups. Due to voter fraud (such as men dressing as women to cast a second ballot) and women gaining too much political sway, New Jersey restricted voting to “free, white, male” citizens. Lastly, suffrage was not “given” to women; it was not a generous, thoughtful gift delivered willingly. Thousands upon thousands of women and men battled for decades for woman suffrage. Myth #3: Men were against women having the right to vote. Nonsense. It was the men of New York who approved woman suffrage in 1917! While most men did oppose woman suffrage in the 1800s, there were plenty of exceptions even then. At the 1848 Seneca Falls Convention, James Mott officiated, Frederick Douglass spoke in support of the suffrage resolution, and 32 men signed the Declaration of Sentiments under the heading “…the gentlemen present in favor of this new movement.” By the early 1900s, there were men marching in suffrage parades and a group of powerful New York men formed the Men’s League for Woman Suffrage. In Essex County, New York, the Men’s Committee of 100 supported the suffragists. The list of 100 prominent men included Melvil Dewey, John Milholland, O. Byron Brewster, George Levi Brown, John Temple Graves, Judge William H. Wadhams, and Rabbi Stephen S. Wise. Myth #4: All women supported suffrage. As surprising as it might seem, many women did not want to be voters. Some reasoned that God ordained their sphere and women’s welfare was represented by husbands. Other women simply wanted no part in the squalor of politics. A few believed that not all women were qualified to vote, intellectually. Myth #5: The woman suffrage movement was a unified movement. Through the blurry looking glass of history, suffragists could appear to work together as a unit, moving forward with a single vision: Votes for Women. However, when the lens is focused, it becomes clear that the suffrage movement was full of fragments, scraps, and segregated groups. Sometimes there was cooperation and cohesion among factions; other times, the atmosphere became cantankerous, even adversarial. From the beginning, in 1869, suffrage organizations were divided, mainly about supporting black suffrage prior to woman suffrage and emphasizing a state-by-state (versus federal) campaign strategy. The American Woman Suffrage Association (AWSA), led by Lucy Stone, favored black suffrage and a state-by-state strategy. On the other hand, the better-known, more radical National Woman Suffrage Association (NWSA), led by Susan B. Anthony and Elizabeth Cady Stanton, proposed a federal amendment (in addition to a state strategy) and opposed black men getting the vote before white women. After working separately for twenty years, the groups merged into the National American Woman Suffrage Association (NAWSA). All of the early leaders passed away by 1907 and under new leadership NAWSA became more conservative. By 1913 Alice Paul, a suffrage leader in Washington, D.C., had adopted more militant, radical strategies and soon broke away from NAWSA to form the National Woman’s Party (NWP). Although NAWSA remained a much larger force (about two million), the NWP attracted several prominent, wealthy supporters, such as Harriet Stanton Blatch, Alva Vanderbilt Belmont and Inez Milholland. Mrs. Howe recalled a prominent male magazine reporter telephoning her for an explanation of suffrage groups in the city. “Would you mind telling me the name of the suffrage organization?” he asked. “Which one?” replied Mrs. Howe. Mrs. Howe explained that the National American was the oldest. “No, the actress is Mary Shaw,” snapped Mrs. Howe. “The National’s president is Rev. At this question, Mrs. Howe’s patience gave way. Mrs. Howe gave him a list of several New York suffrage headquarters and hung up the receiver. After she recovered from the heated conversation, she felt a measly ounce of pity for the magazine man; perhaps he was not completely dim-witted. Upon reviewing her list of suffrage organizations, there did appear to be some basis for confusion. At 303 Fifth Avenue was the Empire State Campaign Committee of NAWSA, chaired by Mrs. Catt, who was also president of the Woman Suffrage Alliance. The same building housed the headquarters of the New York State Woman Suffrage Association, led by Gertrude Foster Brown. Other NYC headquarters included: Woman Suffrage Party at 48 East 34 th Street, led by Mary Garrett Hay; Women’s Political Union at 25 West 45th Street, president Harriot Stanton Blatch; New York headquarters of the Congressional Union at 15 East 41 st Street, headed by Alva Belmont; and, Men’s League for Woman Suffrage at 11 Broadway, headed by banker James Lees Laidlaw. There was also the Equal Franchise Society, Political Equality Association, Collegiate League, and so many other groups and clubs. No wonder the young magazine reporter was so befuddled. How could anyone make sense of the jumble of names and addresses? “If you only knew the unnecessary letters we have to write,” said Mrs. Howe, “and the postage stamps we have to waste, just because the general public gets our headquarters mixed!” Several gentlemen had suggested that all suffragists join together in one organization. “It would be so much easier to remember,” asserted the men. But why should the women do so? To save a few stamps? To unburden men’s memories and protect them from exertion? Marie Jenney Howe believed the tremendous gain in activity and energy outweighed any losses to men’s understanding. The suffrage groups agreed on the overall goal: votes for women. On the surface, the organizations seemed to be facsimiles – all focused on woman suffrage – however, each group had its own innate attraction for a different group of women (and men). Whether it be geographic proximity, religion, race, philosophy, or occupation that brought the group together, the comradery generated enthusiastic participation. Suffragists encompassed a wide swath of society and employed a variety of strategies. Was there some duplication of effort? Sure. Confusion? Sure. Results? 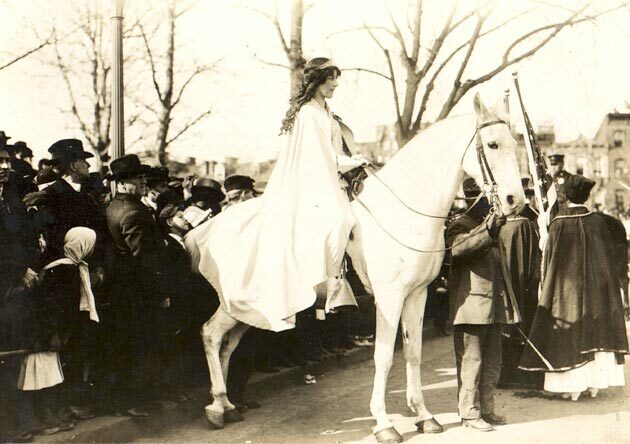 On November 6, 1917, New York State approved woman suffrage. Photo of voting booth, courtesy John Warren. Sandra Weber is a writer, storyteller and performer who portrays Kate Field’s “Among the Adirondacks” lecture. Weber has authored several Adirondack books about regional history and women including Breaking Trail (with Peggy Lynn), Mount Marcy, and Two in the Wilderness. She lives in a log cabin in Elizabethtown, NY. Thanks for this great article Sandra! So informative. As a student at Westport Central School in the early 1960’s, we never learned much about this shared history which is such a shame. 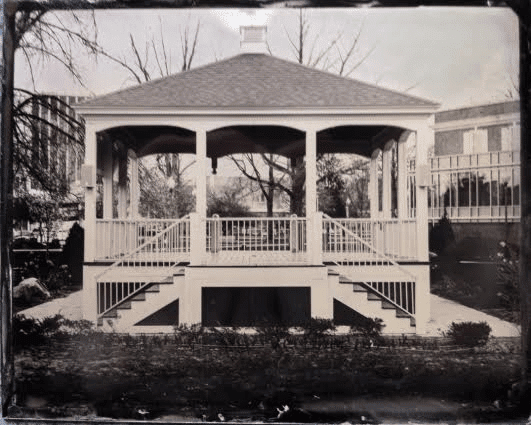 Only after moving to Newark, NY in 8th grade did I become aware of the Suffrage movement – there I was just miles from a hot epicenter (Seneca Falls). It was comforting to read that Westport voted pro-women’s voting rights and did so early on! As a performer also (dancer, actor & musician), I know the power of presenting history in thought provoking theatrical settings. I hope you have a gangbuster season since we are celebrating such a momentous historical event, and you obviously know what you are talking about – kids need to learn this way. understanding of why our ancestors and our current family have such liberal tendencies with respect to women and equality.